Are you bored of the usual sandwich and want to try something else using bread? 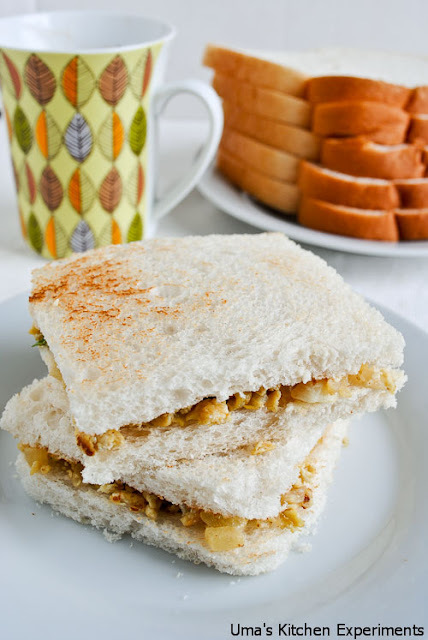 Why don't you try this egg sandwich which is both hot as well as spicy? 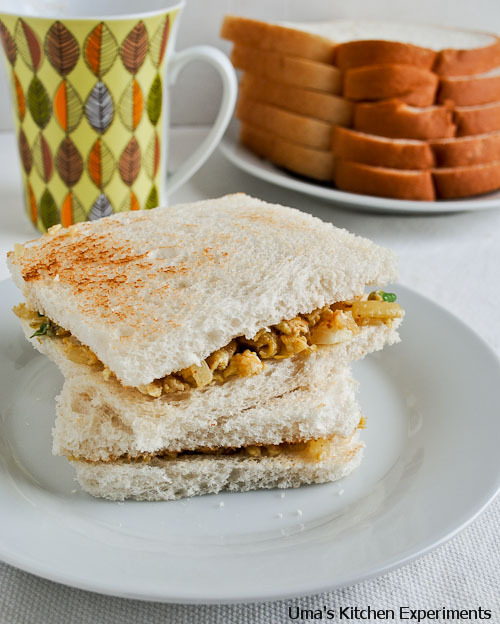 This is a simple homemade sandwich which has scrambled eggs in it. It serves as a good breakfast recipe on lazy weekends. 1) Trim the brown edges of the bread using a knife. 2) Break the eggs carefully and empty the contents in a bowl. Add salt, turmeric powder and pepper powder. Blend them well with a spoon and keep it aside. 3) Take a wide pan and heat oil on it. 4) When oil is warm enough, add mustard seeds and urid dal. Let the seeds pop up. 5) Add curry leaves, green chilies. After few seconds, add onions and saute them well. 6) When onion turn translucent, add the blended egg mixture and stir the contents continuously. 7) Stop the flame when the contents are fried properly without any uneven lumps. 8) Now apply butter on both the sides of the bread and heat them gently in a pan or a toaster. 9) Lay both the breads in a plate and spread out the egg mixture evenly on the surface of the bread. 10) Cover both the breads just like a sandwich and it is ready to be served.